KANSAS CITY, Mo. – There is no cure for her disease, but a Kansas City, Missouri Police officer isn’t letting that stand in her way. "I knew how weak I was and I knew what was going on," said 29-year-old KCMO Officer Sarah Olsen. ALS or Lou Gehrig’s Disease is a nervous system disorder that first started to affect one of Olsen's legs. "I fell backwards on a flight of stairs and cracked my head open. So, we had to get some answers," said Olsen. Officer Olsen has been with the KCMO Police Department for almost seven years. Due to her diagnosis, she is no longer on patrol and has moved to desk duty. "Oh I miss it. That's all I ever wanted to do. I really miss it, but where I'm at, the guys are a lot of fun," said Olsen. Being a police officer isn't Olsen's only passion. She is a die-hard royals fan and on Wednesday night, she threw out the first pitch. "She's a force to be reckoned with [in] the department. She's also a force to be reckoned with ALS. 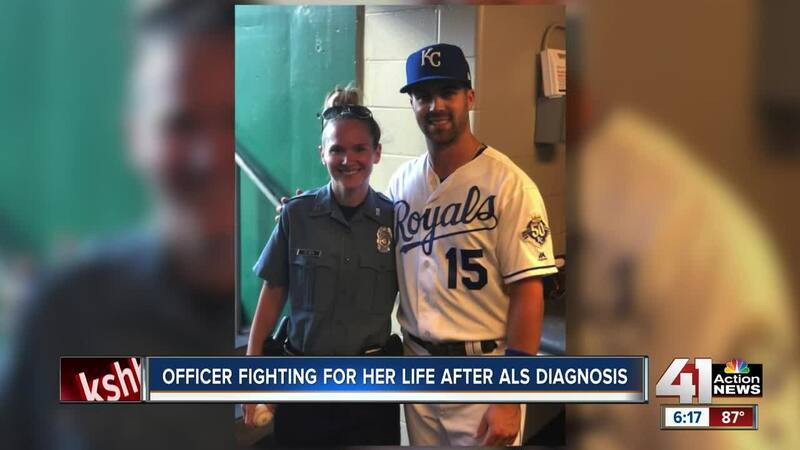 When you have somebody that this has been one of her dreams and she gets to live out that dream, it's pretty cool," said Colleen Wachter with the Kansas City ALS Association. Taking the mound was a life-long dream for Olsen, who is about as much of a Royals fan as there is. She was able to take the mound with Royals great George Brett, who helped make her dream come true. "He came down and met me at a Royals game and we talked for probably 10-15 minutes. He was wanting to know how I was doing and how the ALS association was, if he could help in any way." said Olsen. For now, Olsen is focused on living each day to the fullest. "Somebody, somewhere, is going to survive it. I don't why it can't be me," said Olsen. She has a Gofundme page to help out with her medical needs. Olsen is also walking in the Kansas City Walk to Defeat ALS event in October. You can join her team here .